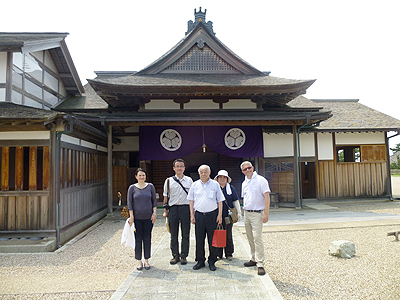 This summer, Nicole Rousmaniere, Research Director of the Sainsbury Institute, and Simon Kaner, Head of the Centre for Archaeology and Heritage, were invited to spend a week in Niigata prefecture. Although known as ‘Snow Country’, the setting for Nobel Laureate Kawabata Yasunari’s famous novel, in the heat of August (high 30s centigrade on a cooler day) it is hard to imagine this area, which lies along the Sea of Japan coast, buried beneath metres of snow. Simon has been working with colleagues in Niigata for over a decade, researching the historic landscapes and archaeology along the Shinano River, Japan’s longest drainage. The area is famous for its iconic Flame pots, two of which were lent to the British Museum for a special exhibition viewed by 112,000 people in autumn 2012. To mark the return of these two wonderful pieces to their native Nagaoka, they were put on display in the remarkable new civic centre, A-ore Nagaoka, designed by the famous contemporary Japanese architect Kengo Kuma, along with some of the other most spectacular examples of this form of vessel from the Middle Jomon period (c. 3500 BC). Simon and Nicole were invited by the Mayor of Nagaoka, Mori Tamio, to Nagaoka to enjoy the huge firework festival for which the city is justly famous (in part commemorating the fire bombing of the city in summer 1945), and to give talks about the exhibition at the British Museum and how Flame pots relate to the other Japanese ceramics held by the Museum, currently being researched by Nicole. Mayor Mori attended the opening of the Flame and Water Pots exhibition at the British Museum in September 2012. 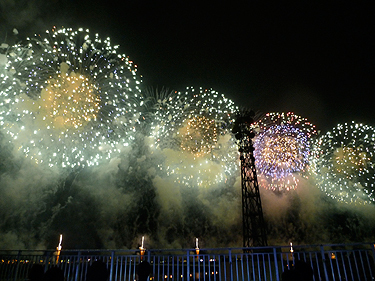 The astounding firework display lasted some two hours and included a three ‘shaku’ firework (the largest in Japan) and a moving component called ‘Phoenix’, embodying the enduring tradition of rebuilding and renewal for which Nagaoka is famous, first performed following the 2004 devastating Chuetsu Earthquake, and which had particular resonance again this year in the aftermath of the 2011 Great East Japan Disaster: groups of school children from the affected areas had been specially invited to Nagaoka to take part in the festival. And Niigata is one of the prefectures which has agreed to accept contaminated debris from the disaster. The next day, we were invited to the new Umataka Jomon Museum, built at the site where Flame pots were first discovered in the 1930s, to talk to a group of school children from Nagaoka. Nicole spoke about curating Japanese archaeology at the British Museum, and Simon explained about Stonehenge (contemporary with the Flame pots), recreating the summer solstice in the classroom, with the audience as the megalithic stones, our Senior Advisor, Professor Kobayashi Tatsuo, as the heelstone, and Nicole as the sun. While in Nagaoka we were treated to a delightful tea ceremony and dinner by Mrs Ota Noriko and her husband, who sponsored the visit by Yamagami Susumu, the Tsugaru Shamisen artist who played at the British Museum during the Flame and Water Potsexhibition, and his visit to Paris during the Jomon World Heritage symposium in January 2012. Leaving Nagaoka, we were taken to the island of Sado, also part of Niigata prefecture and the fourth largest island in the Japanese archipelago, for a three-day tour of sites associated with the gold and silver mines for which the island is famous, and which were in large part responsible for Japan being known as the ‘isles of gold’. We were amazed and impressed by the scale of the surviving facilities, which include the mine tunnels themselves (complete with automated mining mannikins, and now partly used as a store for delicious vintage Sado sake), the reconstructed Edo-period headquarters, the port and processing facilities. The mines were used until the 1970s, and are now the focus of a bid for UNESCO World Heritage Status. We took the jet foil to the port of Ryotsu from Niigata city, a trip of just under an hour, and were put up in a lovely traditional Sado ryokan up on the cliffs overlooking the blue waters of the Japan Sea. As well as being famous today as the base of the world-renowned Kodo drummers, Sado was used in the past as a place of exile for recalcitrant retired Emperors, and boasts the highest density of Noh stages in Japan, many still active today. It is also home to the distinctive red-beaked crested ibis (Nipponia Nippon), reintroduced from China following near extinction, and which lends its Japanese name, toki, to the bullet train that links Tokyo with Niigata. Visits such as this are of the utmost importance to the Sainsbury Institute, as they nurture our research network, and provide opportunities for us to give something back to the communities in Japan that support our research activities. There was great interest in the exhibition at the British Museum, and the audience included some our friends who joined the tour to see the French Palaeolithic caves and Neolithic monuments reported in the last e-magazine. 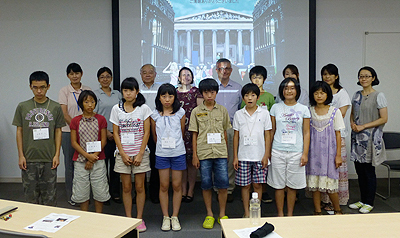 Of particular significance for us was the opportunity to meet with the younger generation interested in museums and archaeology and the Umataka Jomon Museum. Engaging with school children is a new development for the researchers at the Institute, and one on which we will report further in subsequent issues of the e-magazine. 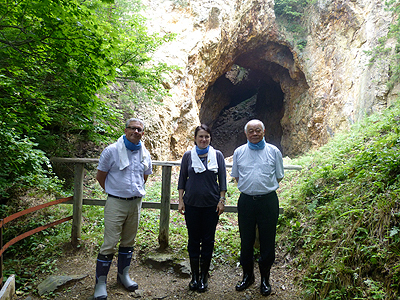 The Sainsbury Institute will continue to develop research interests in Niigata and we will watch the development of the Sado gold and silver mines World Heritage bid with interest. We are very grateful to our hosts in Niigata, especially Mayor Mori of the city of Nagaoka and Professor Kobayashi Tatsuo. Mr Oguma Hiroshi of the Nagaoka Municipal Museum of Science and Mr Miyao Toru of the Niigata Prefectural Museum of History ensured that all of the arrangements in Nagaoka were perfect. See Miyao-san’s article elsewhere in this issue for more on the Niigata Museum. Ozaki Takahiro expertly guided us around the sites of Sado.